Sometimes it's hard to know what to eat. Essential nutrition is hard to understand, especially when there is so much information floating around out there. Some people might say eggs are bad for you, while others swear by its benefits. While nuts and avocados are high in fat, it turns out that there are good fats and bad fats. Just when I think that rice doesn't have a ton of nutrients on its own, I find out it's a complete protein when combined with beans. There's so much to learn, and so much information to sift through in the United States alone. The important to remember, however, is that essential nutrition and weight loss are not the same things. Essential nutrition is what everyone's body needs to run smoothly, while weight loss nutrition will be geared toward a certain lifestyle change or diet. To help us figure out what foods really provide essential nutrition in one fell swoop, Knoema created a handy infographic. They took the information from the U.S. Department of Agriculture and distilled it down into an easy-to-read, easy-to-understand format. Knoema explains that healthy, balanced diets are all about combining foods and creating a diet that meets the recommended daily values. These daily values can change depending on your body weight and what's required to support your specific lifestyle and essential nutrition actions. The recommended daily values suggested below are based on a 155-pound body weight consuming a 2,000 daily caloric intake. Some daily intakes shouldn't be exceeded. For example, consuming calcium or iron in excess of the recommended value can be detrimental to digestive health, or create toxic situations for our bodies. Other vitamins like Vitamin B are water-soluble and are less easy to overdose on. Iron - Provides the body with oxygen and aids in detoxification. Calcium - Balances the brain, aids in transmission of nerve impulses, and affects enzyme activity. Magnesium - Affects energy processes, especially in the heart and muscles. Copper - Forms collagen and elastin, supporting healthy skin. Selenium - Improves reproduction function and regulates the thyroid gland. Phosphorus - Stores genetic information and assists in cell growth. Zinc - Important for memory, functioning of the central nervous system, and has wound-healing properties. 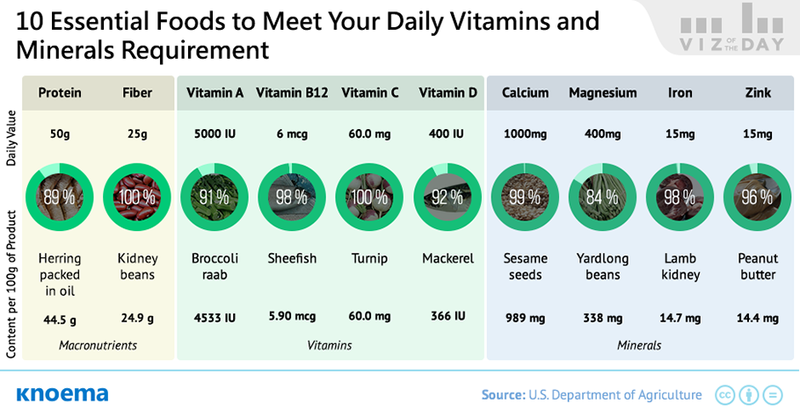 B vitamins (like riboflavin, thiamin, B6, B12, and niacin) - Aids in the digestive and cardiovascular system; lack of vitamin B can lead to hair loss, skin disease, and other symptoms. Vitamin D - Helps the body absorb calcium, regulate cell growth, reduces inflammation, and supports a healthy immune system. Vitamin K - An antioxidant that aids the immune system. Not into eating herring or lamb kidney to get essential nutrients? Lucky for you, Knoema anticipated this! They created a Live View function on their website that allows you to seek out additional nutrition information about any food. Select a food from the drop-down to compare its nutrition value to the recommended daily value. Pretty handy! For example, if I choose eggs from the drop down, it tells me the nutrient values of eggs right next to the recommended daily values. So I can see that eggs provide 30.7 of 35 recommended intake of selenium (great for regulating my thyroid). Eggs don't, however, contain a significant value in zinc so I decided to take a look at oysters. I learned that they contain more than double the recommended value of zinc. Great! Finally, you can look at the protein content of each food by comparing it to the top 100 ranked protein foods. The selected food will show up as a rank number as it compares to the other foods. As it turns out, egg whites are a great source of protein but my whole eggs rank 101 in the list. This information is a great step in the right direction towards creating a balanced and healthy diet. Armed with this information, we can make healthy choices towards selecting nutrient dense foods.